Comparable to SON-T; Lighting: An improved understanding of the performance characteristics of the Attis units was achieved. Positive results were achieved in relation to plant height, stem width, leaf width, number of leaves, number of nodes, number of flowers/fruit and fresh and dry weights. As a result of the early trials a number of design changes were actioned in order to improve the overall performance of the Attis units. Between 2011 and 2013 Rothamsted Research undertook a number of trials with PhytoLux LED lights on a wide variety of plant species including; lettuce, tomatoes, radish, lillies, peppers, chinese cabbage, rice, wheat, barley, cotton, arabidopsis, maize. These trials were carried out to measure the response of plants to LED lighting when used as a supplemental top light in glasshouses. Lights come on when ambient light falls below a pre-defined level. During these extensive trials, numerous results were measured including plant height, stem width, leaf width, number of leaves, number of nodes, number of flowers/fruit and fresh and dry weights. 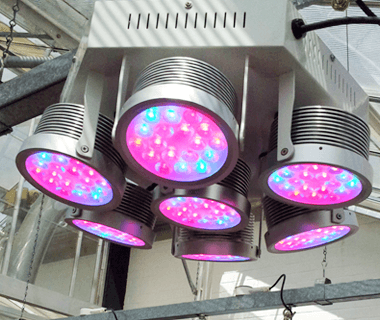 The performance of PhytoLux units was compared against the SON-T growth light, traditionally used by commercial growers. During the 18 month period multiple trials were carried out at different intervals, with insights from each trial resulting in small, but important, design changes. Throughout the trials plant response was comparable with, in some cases better than, the SON-T ‘Control'. Trials have also reviewed operational processes and policies to highlight the energy savings possible with PhytoLux units. 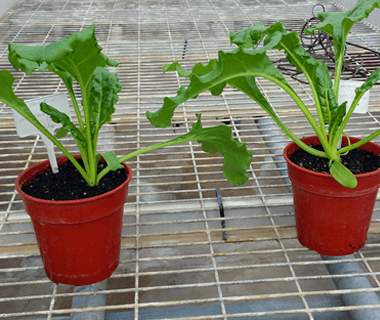 Rothamsted Research has initiated a programme to replace SON-T with PhytoLux lights targeting to reduce total electricity consumption within its glasshouses by 50%. 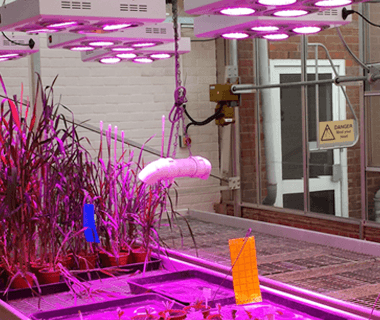 As part of the Rothamsted trial PhytoLux experimented with products from our range in order to determine their effect within smaller, cabinet environments. Initial trials measured the response of plants grown in a cabinet having 170W of fluorescent lighting. 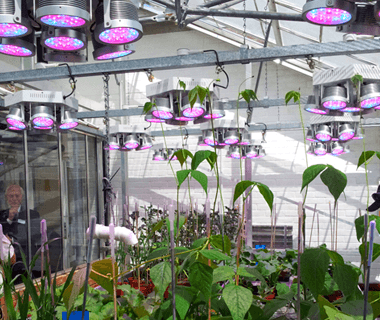 The Attis-6 which consumes 160W was installed to monitor the response of radish plants grown from seed. 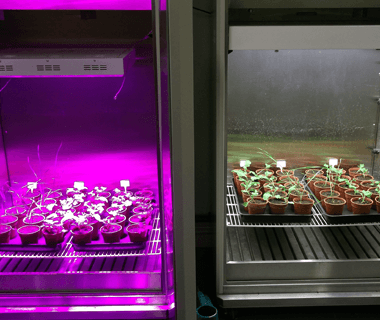 Results from the LED-lit cabinet showed significantly greater plant growth when compared to the fluorescent-lit cabinet. The radish trials were extended to compare the Attis-6 (160W) to fluorescent lighting (340W) when installed in a growth cabinet. The plants grown in the LED cabinet produced better overall results. Rothamsted Research analysed the impact of radiated heat on the plant canopy. When in operation SON-T lights emit a high level of radiated heat and raise the temperature in the glasshouse compartments. The high level of radiated heat from the SON-T can cause scorching of the plant leaf. By contrast, the PhytoLux LED lights generate much lower heat. Typically running at 55°C, the build-up of heat within the glasshouse during the summer is more easily managed with less reliance on cooling systems. Raising glasshouse compartment temperature by 1 to 1.5°C in the winter ensures consistent plant response compensating for lower radiated heat. 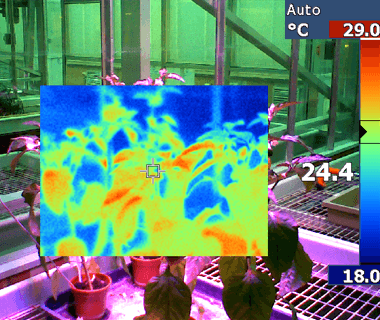 Thermal imaging was used to identify relative leaf temperatures of various crops. Rothamsted has been a major contributor to the trial and development stage of the Attis range and we are very grateful for their valuable insights which have helped us considerably in our objective to build an LED growth light that will provide a commercially viable option for growers to extend their season into the winter months.